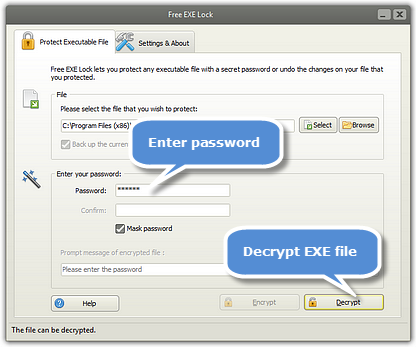 The first and foremost question that comes to mind with the term EXE locker is in fact what an EXE file or executable file is? Well to simplify things let’s just say it’s like a door for your programs and applications. When you want to open or launch a program you double click its icon to open it, that icon is actually an executable file which gives you access to your program like a door would. So now that we have gotten that out of the way we can now begin to understand the importance of EXE files present on our computers. Some people just like to hide the folders containing their private files and programs and they consider it safe enough but that’s just not secure because the hidden folders on a computer can easily be found by just running a search or by enabling the show hidden files and folders option in the folder viewing option of windows. One step further than this are the people who use a software to password protect their private files and folders but what they don’t realize is that they are leaving the EXE files of their private programs unprotected and if a search is done through start by the name of that program the EXE file will pop up and the program will become accessible just like that, this is where Free EXE Lock comes in, a software designed to protect your executable files which you want to keep private such as any kind of programs that you don’t want anyone else using on your pc if you share your computer with someone or if you have games on your computer such as Grand Theft Auto or Saints Row and someone younger than 16 uses that same computer you can lock the executable files for such games using Free EXE locker. Your browser that you use so often also uses an executable file to launch. Browsers now a day store your password, your cyber footprints, and all your social accounts such as Twitter, Facebook the lot. People who use the online banking systems are the most vulnerable in this case. 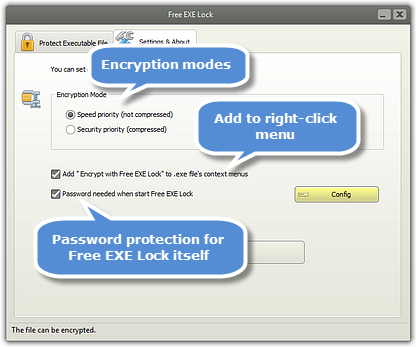 All the common browsers provide respectable security for you to protect you from a cyber-attack and protect your data but if someone tries to access your data from your computer there is no security for that but with Free EXE lock you can just lock the executable file for your browser and voila all your personal data will be password protected. 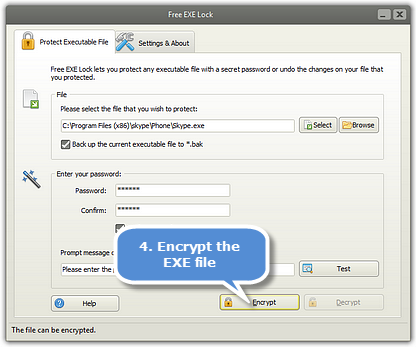 Choose the encryption method you want and set the password. Now click encrypt and you are all set. To decrypt all you have to do is enter the password again and press decrypt and now you will be able to access your files. If this all seems complicated there are video tutorials on their website too, which can guide you step by step through the process.